"A fitness program inspired by nature for people who would rather be outside than in a gym. Learn natural movements to tone and sculpt your body." You know you need to exercise and eat healthy if you want to look and feel your best. The problem is… it's too hard to stick with a fitness routine long enough to see real and lasting results! But who can blame you? You endure day after day of this exhausting grind. How on earth are you supposed to fit trips to the gym and restrictive dieting into all this? Simple. You don't have to. You can enjoy the best health of your life easier and faster than you ever thought possible… WITHOUT spending hours at the gym, counting every calorie, popping pills, or pinning your hopes on useless health gimmicks. Are You Ready to Build a Strong Lean Body? You don't need to look very far to realize humans as a species have come a long way. Technology, art, reading and writing, and even space travel – wow! We've invented some amazing things and while modern society offers us many benefits… it's not without serious downsides. Not all that long ago we were forced to hunt, gather, and stay active to survive. Now? Well, just think about your own life. A far cry from the active lifestyle of our ancestors, right? And, hey, that's fine. You're not the only one. The fact is, if you've read this far it's because you know something needs to change. Your body – and your friend's, neighbor's, and co-worker's bodies -- have become domesticated and are no longer in a state of healthy homeostasis. You've unknowingly been working against the laws of Nature. While we CAN'T turn back time and become nomadic hunter-gatherers again like our distant ancestors… we CAN transform our health by taking action now and using Nature to our benefit. Kevin has been a personal trainer since 2007 specializing in natural movement and plant based nutrition. He is also the co-founder of WAWU. He is a health activist, a lifelong athlete, a runner, a bike racer, and a nature lover. His is passionate about helping people achieve sustainable long-term health and fitness, in order to regain their place as vibrant human beings in the natural web of life, while achieving a higher level of conscious existence in their bodies and on the planet. 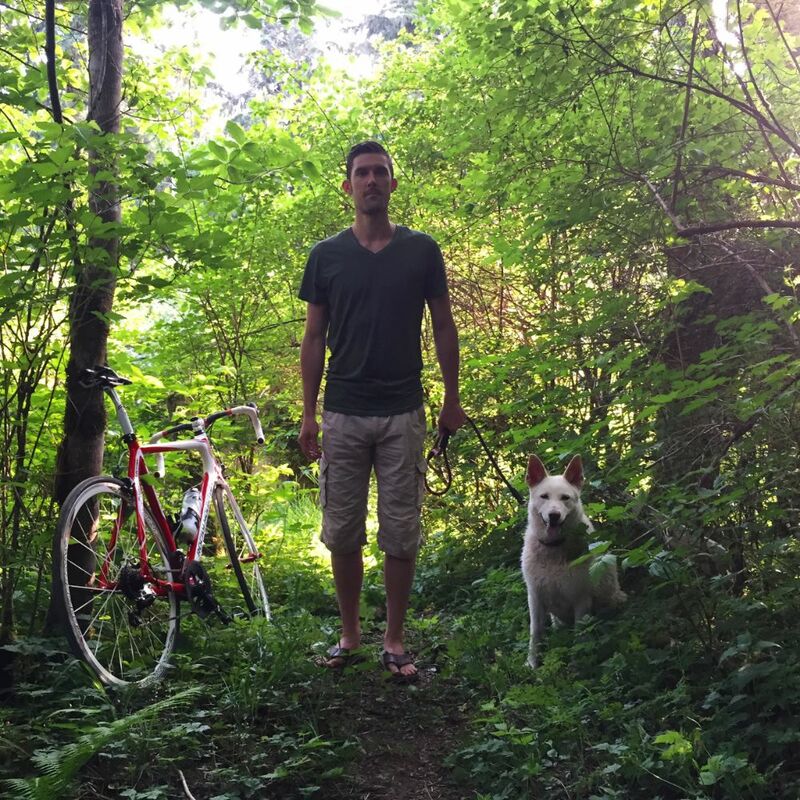 He loves trail running with his dog, riding his bike, swimming in rivers, camping, hiking, gardening and wild food foraging. He looks forward to helping you discover your Wild Body in the Wild Body Program! Rewilding doesn't mean living in caves … gathering all your food from Nature … or demonizing human society. It's about reconnecting with Nature – and yourself – in powerful, meaningful ways so you can access the good health and energy your body was designed to enjoy! What happens when you rewild your body? When you rewild your body, some amazing things start to happen – FAST! Imagine … instead of trying to schedule trips to the gym into your crazy schedule … hassling with awkward gym equipment … and paying hefty gym membership fees … you get all the exercise you need simply spending 30 minutes a day outdoors! Within as little as 7 days you'll notice a change in the way your body looks and feels, and you'll greet each morning with more energy than you've felt since you were a kid! If this sounds a little too good to be true, I understand. There are so many health and nutrition gimmicks on the market you have every right to be skeptical. I'm the founder of rewildyourbody.com and The Wild Body Program. I'm a certified personal trainer and I've been helping people like you get healthy and fit since 2007. I love being as fit and strong as I can possibly be and pushing my body to it's limits through various forms of movement and physical activity and then discovering what lies beyond those limits. I wasn't always into health, and I wasn't always that fit either, in fact I was quite the opposite. There was a point in my life where I was so sick and unhappy with my body that I could barely carry on living. I didn't see any way out. I tried different things but I didn't really know what I was doing and none of it worked anyways. My lifestyle caught up with me. I had completely lost my connection to my body. It was weak, sick, and ached. I couldn't do the activities I wanted to do anymore. My diet was full of junk food. I ate fast food on a daily basis, smoked, and did all sorts of other things that were NOT good for me. But...I didn't really know any better. I hadn't made the connection yet between diet and lifestyle, and HEALTH, ENERGY, VITALITY, and HAPPINESS. I reached a point where I didn't want to go on living this way anymore and I started seeking answers. I completely immersed myself into the world of health and fitness and learned all that I could. I started making changes, some small and some big... and I started to exercise almost daily...nothing too intense at first. I noticed results immediately. Instead of feeling terrible and depressed all the time I began to feel amazing! The more I stuck with it the better things got. I watched my body transform right before my eyes and my mind changed too. I was finally confident in myself. I felt like anything was possible. The more I studied about fitness and nutrition the more I learned that the natural approach works best. I was literally getting closer to nature with the way I ate, and the way I moved, and the closer to nature I got, the better I felt and looked. I felt so great, and so happy and knew that there must be others who were going through what I went through with my body and I wanted to help them using the knowledge and experience I acquired. Re-discovering my connection to my body through fitness, movement, and healthy eating literally saved my life. The results of these changes on my own life were so profound that I felt called to share this information with others... That's when I became a personal trainer and started helping others rewild their bodies and reach the vibrant state of health and fitness that we ALL deserve to have. Become fit enough to do more physically challenging outdoor activities with you friends and loved ones, like hiking, kayaking, backpacking, trail running, and swimming. Videos demonstrating each movement in the safest and most effective way so that you'll never be left guessing “Am I doing this right?" Information about cooking and preparing different foods, sports nutrition basics, antioxidants, sea vegetables and much more! A place where you can share your successes, challenges and questions, and receive coaching, support and encouragement every step of the way. Try out The Wild Body Program for 30 days and decide later if it's worth your investment. If at any point during the 30 days you feel that this program just isn't for you then we'll give you a 100% refund right away. We want you to get results in this program. We want you to feel awesome, energized, vibrant and Wild! If you don't experience any of these feelings, then we haven't delivered on our promise to you, and don't feel that we've earned your hard earned money. We're all about doing business with integrity and honesty. We want all of our customers to be happy with the exchange that takes place. If you aren't then we aren't. Our team has worked very hard to pack as much value as we can into this program and we've tested the whole program month after month to ensure it gets proven results, time after time, person after person. Whether you get these results or not is up to you. There is no easy way to better fitness and health. You have to put in the hard work and dedication to achieving your goals. Our program is designed to give you all of the information, step by step guidelines, and support needed to achieve your goals. It's up to you to make the commitment to yourself, and to the program. We can't do that for you. We expect that you will ask for help any time you need it and not give up on yourself. When we see your order we see that as your commitment to yourself and this program.
" What I like about the program is that it covers everything. It's not a diet or a gym membership but it teaches you healthy nutrition and healthy movement. The videos are very good for instruction and the recipes are delicious. Having experts available via Facebook is a really good plus, because you can get your questions answered by knowledgeable and friendly people who really want to see you succeed in improving your life. Most of all, I like that I don't have to read a book and then come up with my own plan. You tell me what to do and I do it, which both makes it easier to follow and helps me learn and experiment with new ideas at a non-intimidating pace. I recommend this to anyone looking to improve their body, stamina, diet, mood, or self-image, and especially for anyone who wants to get more active or who values nature and natural living." It's been almost a month since doing this program, and I can honestly say it works! The one thing that helps me the most? The food! By just watching what I eat and cutting out sugar almost entirely from my diet, I have already lost a lot of weight! :) Thanks guys, here's to more change in the next months! Are already extremely fit and healthy: if you're highly active, already do intense exercise on a regular basis (3-5 days per week or more), or are a pro athlete. The key to success in anything is having the support and community you need to help you get through it. A place where you can share your successes, challenges and questions, and receive coaching, support and encouragement every step of the way. That is why we are giving you LIFETIME access to our private Wild Body Support Group on Facebook where you will have access to the Wild Body Team and a whole community of other participants in the Wild Body Program, from all over the world. Now, you can skip boring workouts at the gym, forget about counting calories, enjoy more time for rest – and still look and feel better than ever! This is a completely self-paced online course - you decide when you start and when you finish. You have access to the course and the support community forever. Will you be sending me anything in the mail? No. The Wild Body Program is a 100% digitally delivered product. In an effort to be as environmentally friendly as possible We Are Wildness has chosen to reduce our carbon footprint by offering this product in a digital only version which eliminates the need for paper, ink, packaging and fossil fuels for transporting through the mailing system. We will be sending your program to your email inbox. You may decide to print the program on 100% recycled paper for easy viewing. Do I need any special equipment or a gym membership? Where can I do the workouts? Anywhere! Ideally outside in natural surroundings. A park, field, your back yard, the beach, or indoors are great places to get active. Am I too old for this type of fitness program? No way! You're never too old for natural movement. In fact, regular exercise and strength training can improve your overall quality of life, fend off disease, and even add YEARS to your life. The program is designed for anyone of any age or current level of fitness, no matter where you are starting out at. I am overweight; can I still do this program or should I wait to lose some weight first? There is no better time to start your weight loss journey and no better way to do it than with exercise and healthy eating habits. Your body will benefit from the gradual progression and the workouts are designed to stimulate your metabolism and help you lose weight. Our nutritionist designed meal plans and recipes will assist you in your weight loss journey and give you the nourishment and energy you need to enjoy your workouts and succeed in this program. I haven't worked out before, will I be able to handle this? You are capable of so much more than you think. You will learn all of the basics of natural fitness and get a great healthy start on staying fit for the rest of your life. With the support provided and a whole community of program participants, doing this along with you, you will have everything you need to be successful on this quest to make fitness a part of your lifestyle. Will following this fitness program make me big and bulky? No. This program is designed to encourage fat loss and lean toned functional muscle. Just like a wild human would have. Your body WILL look better and feel better because you will burn fat and show more muscle definition. This is NOT a body building program! What happens if I can't make it through the full 30 days and give up early? Don't worry. We've done our best to give you all of the tools and support you need to complete this program, but sometimes it doesn't work out that way. We all have busy lives and unexpected events and you shouldn't beat yourself up or feel defeated if you don't get through it the first time around or have some hiccups here and there. The most important thing is that you get back on board and try again. We'll be here to support your journey every step of the way. You will have lifetime access to the private support group and will be able to enjoy unlimited use of the program once you download it. It's yours to keep forever!